Where have you heard these? The answer is in the movie Batman Forever. They are the three riddles that the character the Riddler poses to the man bat in the film. In reality the person who created them was Will Shortz, a legend in the field of riddles and logic puzzles. To verify this, one need look no further than his résumé: he has been the crossword puzzle editor of The New York Times since 1993, a contributor to the Weekend Edition Sunday show since its premiere in 1987, and is the only person in the world who has a college degree (from the University of Indiana) in enigmatology, that is, the study of puzzles – in addition to appearing in such popular series as The Simpsons and How I Met Your Mother. Shortz was also the founder and creator of the World Puzzle Championship, whose first edition was held in New York in 1992. The 25th and most recent edition took place in Senec (Slovakia) on 16-23 October 2016. 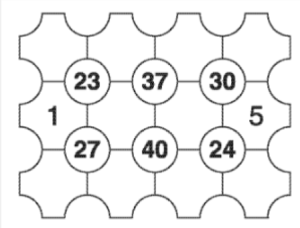 What kind of puzzles do the participants face? Would I be able to solve them? To answer these and similar questions, the World Puzzle Federation has organized since 2014 a parallel online competition, the Puzzle Grand Prix, which allows anyone who wishes to register to participate from their home and face puzzles similar to those of the official championships and, in many cases, designed by the same authors. Remove two matches so that the resulting equation remains correct. All the words on the list except one meet the same requirement or condition (and it is not related to their meaning, but to their appearance). Identify the exception that does not follow that rule. 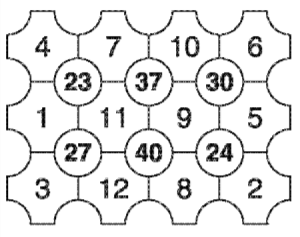 Place the remaining numbers 1-12 (1 and 5 are already present) in the empty boxes, so that each circumscribed number is the result of adding the four boxes that surround it. Click the button and you will see the solutions to these three puzzles and to the riddles posed by The Riddler in Batman Forever. All the words have some type of symmetry except CHAOTIC. And the solution to the three riddles of the Riddler: A watch. A match. The pawns in chess.